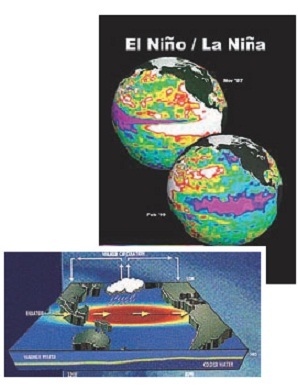 The temperature over Pacific Ocean will undertake changes every five or seven years and scientists had named this as Southern oscillation or it is called as El Nino in Spanish language. Due to changes in the temperature around the ocean, the surrounding countries may face cyclones, floods or sudden rains. This is occurring naturally and it is not in our hands but humans are affecting the temperature on the earth with harmful tasks. So as a result of this, El Nino characteristics are seen every 2 to 3 years and their effect had also increased. The people there are trying to protect the environment which protects them.